This little steamer was in some ways typical of the smaller vessels in the British merchant fleet during World War 2. One of the interesting things about her is the composition of the crew. 17 of the crew of 35 have their home towns recorded. Of those, 6 came from Glamorgan, with the Master actually coming from Barry. The Manaqui was one of four similar ships of 2,802 tons built for the United Fruit Company in 1921. In 1937 the Manaqui was sold to Furness Whithy and Co. On February 19, 1942 she sailed from Cardiff with a general cargo, bound for Kingston, Jamaica with an anticipated arrival date of March 20th. The voyage led to Belfast Lough to join convoy OS.20, which then left the UK on February 23rd. 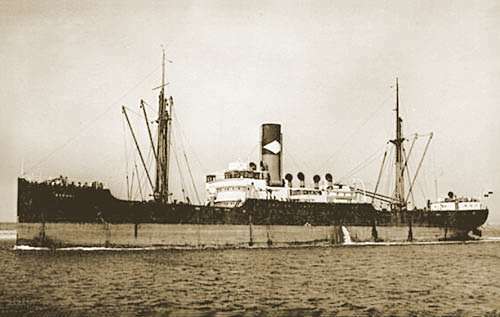 The SS Manaqui never got to Kingston, and is understood to have been sunk by a submarine on or about the 15th March, near Barbuda. All on board - Master, 34 crew members and 6 gunners - were lost. The fully laden Manaqui would have been much lower in the water than the ship in this picture (one of SS Macabi, SS Manaqui, SS Maravi, SS Mayari: identical sister ships built for United Fruit) showing the the house colours of United Fruit on the funnel. AHLBOM, Able Seaman, SVEN ERIK, S.S. Manaqui (London). Merchant Navy. 15th March 1942. Age 22. ALDOUS, Able Seaman, HENRY LEONARD, S.S. Manaqui (London). Merchant Navy. 15th March 1942. Age 40. Son of Arthur Thomas Aldous and Mary Lavinia Aldous, of Fulham, London. APPLEBY, Ordinary Seaman, WILLIAM, S.S. Manaqui (London). Merchant Navy. 15th March 1942. Age 21. Son of Alfred and Eunice Appleby, of Normanton, Yorkshire. BALL, Sailor, JAMES ALAN, S.S. Manaqui (London). Merchant Navy. 15th March 1942. Age 21. Son of Mr. and Mrs. W. J. Ball, of Bexhill-on-Sea, Sussex. BOYLAND, Greaser, WILLIAM HENRY, S.S. Manaqui (London). Merchant Navy. 15th March 1942. Age 32. BROWN, Second Engineer Officer, GEORGE JAMES, S.S. Manaqui (London). Merchant Navy. 15th March 1942. Age 49. Son of Alexander and Margaret Brown; husband of Beatrice Baillie Brown, of Broughty Ferry, Angus. BURTON, Chief Engineer Officer, EDWIN, S.S. Manaqui (London). Merchant Navy. 15th March 1942. Age 50. Husband of Irene Olive Burton, of Sidcup, Kent. CABLES, Third Officer, JAMES PATRICK MURRAY, S.S. Manaqui (London). Merchant Navy. 15th March 1942. Age 24. CANLAN, Greaser, MICHAEL, S.S. Manaqui (London). Merchant Navy. 15th March 1942. Age 26. Son of Cornelius and Josephine Canlan, of Cardiff. CLARK, Cook, WILLIAM JOHN HENRY, S.S. Manaqui (London). Merchant Navy. 15th March 1942. Age 32. Son of Walter Willie and Mary Ann Elizabeth Clark. COLYER, Donkeyman, FREDERICK WILLIAM, S.S. Manaqui (London). Merchant Navy. 15th March 1942. Age 41. Son of Henry and Jane Colyer, of Dagenham, Essex. ELLIOTT, Fireman, NIGEL NOEL, S.S. Manaqui (London). Merchant Navy. 15th March 1942. Age 33. GRAHAM, Fourth Engineer Officer, JOHN ROSS, S.S. Manaqui (London). Merchant Navy. 15th March 1942. Age 22. HALSE, Ordinary Seaman, GEORGE LLEWELLYN, S.S. Manaqui (London). Merchant Navy. 15th March 1942. Age 20. Son of George and Charlotte Halse, of Pencoed, Glamorgan. HENDERSON, Second Radio Officer, GEORGE ESKDALE, S.S. Manaqui (London). Merchant Navy. 15th March 1942. Age 21. HOLMES, Second Engineer Officer, RICHARD THOMAS WILLIAM, S.S. Manaqui (London). Merchant Navy. 15th March 1942. Age 28. Son of George and Maud Helen Holmes; husband of Elsie Maud Holmes, of Greenwich, London. HOPKINS, Boatswain, JOHN HENRY, S.S. Manaqui (London). Merchant Navy. 15th March 1942. Age 36. JACKSON, First Radio Officer, CYRIL CHARLES ALBERT, S.S. Manaqui (London). Merchant Navy. 15th March 1942. Age 33. Son of Charles James Jackson and Eliza Jackson. LAMBERT, Fireman, THOMAS, S.S. Manaqui (London). Merchant Navy. 15th March 1942. Age 47. LORENZ, Carpenter, JOHN, S.S. Manaqui (London). Merchant Navy. 15th March 1942. Age 60. MANN, Third Engineer Officer, JOHN WILLIAM, S.S. Manaqui (London). Merchant Navy. 15th March 1942. Age 48. MAPES, Assistant Cook, GORDON ARTHUR, S.S. Manaqui (London). Merchant Navy. 15th March 1942. Age 23. MATTHEWS, Deck Boy, THOMAS, S.S. Manaqui (London). Merchant Navy. 15th March 1942. Age 18. Son of Mr. and Mrs. Evan Owen Matthews, of Cymmer, Porth, Glamorgan. NEAL, Able Seaman, PERCY, S.S. Manaqui (London). Merchant Navy. 15th March 1942. Age 49. Husband of A. A. Neal, of Church Crookham, Hampshire. PHILLIPS, Assistant Steward, EMRYS OWEN, S.S. Manaqui (London). Merchant Navy. 15th March 1942. Age 37. Son of John Thomas Phillips and Martha Phillips; husband of Gwlitnyn Barbara Phillips, of Risca, Monmouthshire. PHILLIPS, Greaser, WILLIAM GEORGE, S.S. Manaqui (London). Merchant Navy. 15th March 1942. Age 36. Son of William and Sophie Phillips; husband of Lillian Maud Phillips, of Grange Town, Glamorgan. RANDALL, Steward, WALTER SAMUEL, S.S. Manaqui (London). Merchant Navy. 15th March 1942. Age 32. Husband of R. C. Randall, of Whitfield Town, Jamaica. ROBERTS, Steward, MALCOLM MYLES, S.S. Manaqui (London). Merchant Navy. 15th March 1942. Age 23. Son of Dr. R. Ellis Roberts, M.B., and of Elvira Roberts. SCOREY, Deck Boy, ROBERT JOHN GEORGE, S.S. Manaqui (London). Merchant Navy. 15th March 1942. Age 19. Son of Robert Henry and Emily Scorey, of Aberdare, Glamorgan. TAPP, Chief Officer, JOHN HARRY, S.S. Manaqui (London). Merchant Navy. 15th March 1942. Age 39. Son of Harry and Selina Tapp; husband of Doris Lilian Tapp, of Hove, Sussex. WAREHAM, Able Seaman, WILLIAM ROY, S.S. Manaqui (London). Merchant Navy. 15th March 1942. Age 19. WILLIAMSON, Chief Steward, JAMES, S.S. Manaqui (London). Merchant Navy. 15th March 1942. Age 34. WORDINGHAM, Master, CHARLES E., S.S. Manaqui (London). Merchant Navy. 15th March 1942. Age 54. Husband of Susan Wordingham, of Barry, Glamorgan. BOWTELL, Able Seaman, EDWARD JOSEPH, P/JX 291009. H.M.S. President III. Royal Navy. (lost in S.S. Manaqui) 15th March 1942. Age 21. Son of Edward Donald Clarke Bowtell and May Neal Bowtell, of Hinckley, Leicestershire. DAVIS, Able Seaman, ERIC GEORGE, P/JX 215140. H.M.S. President III. Royal Navy. (lost in S.S. Manaqui). 15th March 1942. Age 29. Son of George and Daisy Lilian Davis; husband of Joyce Mary Davis, of Henley-on-Thames, Oxfordshire. TYRRELL, Able Seaman, ARTHUR CHARLES, P/JX268360. H.M.S. President III. Royal Navy. (lost in S.S. Manaqui). 15th March 1942. Age 34. Son of Edward and Caroline Tyrrell; husband of Sarah Ann Tyrrell, of Colliers Wood, Surrey. COULSTOCK, Lance Bombardier, BASIL HUGH, 6343179, 5/3 Maritime Regt., Royal Artillery. 15 March 1942. HASTINGS, Able Seaman, CHARLES, C/JX 289572, S.S. Manaqui, Royal Navy. 15 March 1942. Age 39. Son of Priscilla Hastings; husband of Daisy Hastings, of St. Pancras, London. MITCHELL, Gunner, ALBERT EDWARD, 6400109, 5/3 Maritime Regt., Royal Artillery. 15 March 1942. Age 22. Son of Alfred Edward Mitchell; husband of Gladys Edith Mitchell, of Worthing, Sussex.